Stephen Allen Schwartz, 71, of Syracuse died in his home on Saturday, April 13 at 6:12 AM. Steve was born on December 11, 1947 in Bluffton, Indiana. He was the youngest of three sons born to Wendell (Bill) and Doris (Elzey) Schwartz. He graduated from Indiana University and served in the U.S. Navy for four years. On August 4, 1973, Steve married Patricia (Moyer) Schwartz from Fort Wayne, Indiana and together they had two sons. After working in the food brokerage business for 46 years, he retired from Peer Food Group on 5/22/18. 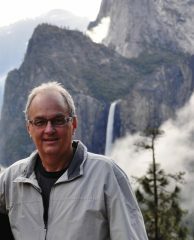 Steve was a dedicated member and leader at Calvary United Methodist Church in Syracuse. Besides being an active church leader, he was passionate about singing, and especially loved leading the children’s choir. He also served on the board of the Papakeechie Protective Association. Steve enjoyed camping with his family and dogs, visiting State and National Parks, hiking, kayaking and bicycling. He is survived and will be lovingly remembered by his wife, Patty, son, Brian (Rosalyn) Schwartz of Leesburg, Indiana and son, Cliff Schwartz of Minneapolis, Minnesota, and two grandchildren, Isabel and Samuel Schwartz, who always brought a huge smile to their grandpa’s face. Steve is also survived by two brothers, Ron (Dian) Schwartz, Crown Point and Dave (Jo) Schwartz, Syracuse, who were his best friends. Visitation will be at Calvary United Methodist Church, 801 S. Huntington St., Syracuse, IN on April 19, 2019 from 10:00 am until Noon. A Celebration of Life service will be at Noon. The family would like memorials in lieu of flowers to go to Calvary UM Church and/or Sleep in Heavenly Peace (building beds for children without one – organized through Calvary UMC). Eastlund Funeral Home is handling arrangements.